Om is a self-proclaimed interior designer and likes to share ideas and tips on how to redesign your home. Cooking should be a pleasure, not a chore. To make your cooking activity as smooth and fun as possible, your kitchen must be both functional and inspiring. Even if you are not someone who would spend a lot of time in the kitchen creating a homemade pizza from scratch or baking a birthday cake for a party of dozens, wouldn't it be great to have a cheery-looking place to brew your coffee in the morning? A well-organized spot to assemble sandwiches for your kids with no fuss? A welcoming space to fix a quick dinner when you return home? I'm sure we all want to have a beautiful and user-friendly kitchen. Some might even wish they could rip up the whole floor and change everything from the kitchen sink and stove to cabinets and utensils. Alas, budget can be a huge stumbling block for many of us, especially in this not-so-rosy economy. That doesn't mean you should just put up with a lackluster kitchen, though. Here are some kitchen redesign ideas that low-budget homeowners can adopt without having to break the bank. How much money and time are you willing to spend on this kitchen makeover? Try to come up with a realistic number you're most comfortable with, then religiously stick to it. The timeline is also very important. Some of these makeover projects can be completed within a few hours whereas the others would take days. 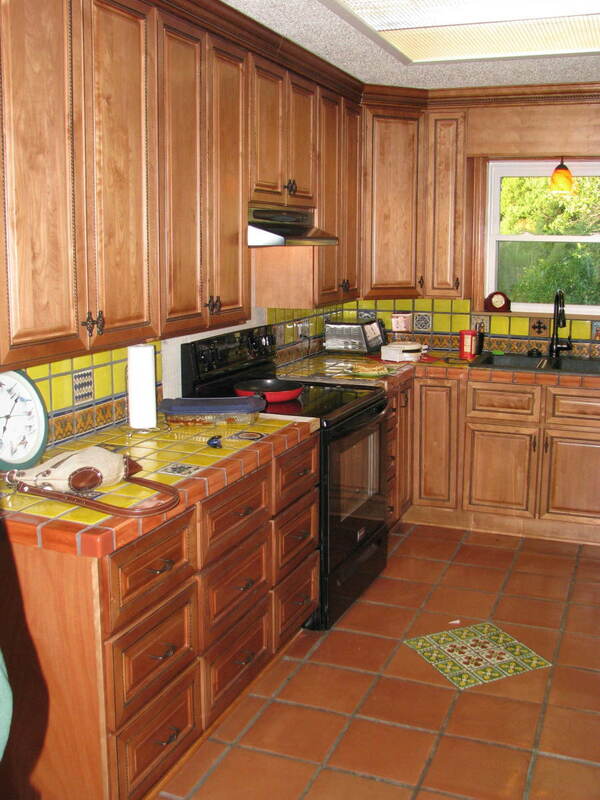 Do you want to redesign your kitchen on a leisurely pace no matter how long it takes? Do you prefer speedy decoration that requires just a day or two to finish? Or do you need the updates to be done within a few weeks before your nitpicking mother-in-law arrives for a visit? Having a deadline will make project planning a lot easier and can be an effective motivator as well. Take some time to evaluate your kitchen and write down what you don't like about it. 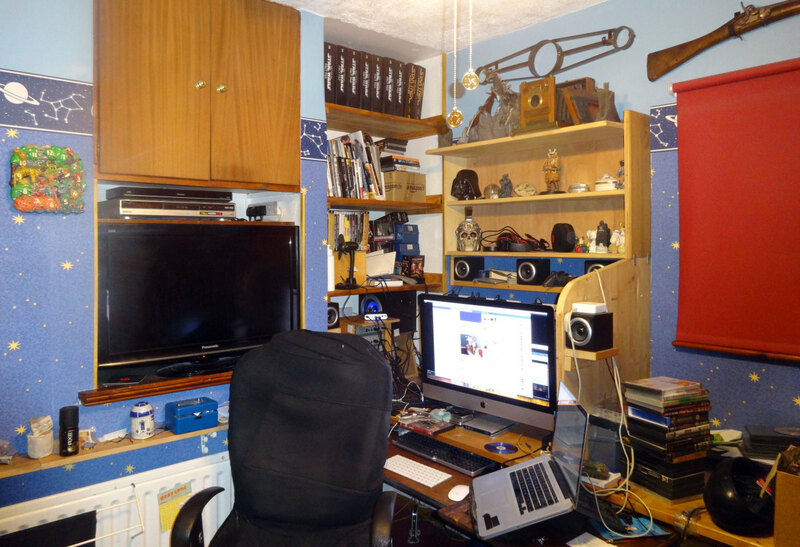 Does the room appear so cramped it could freak out a claustrophobic patient? 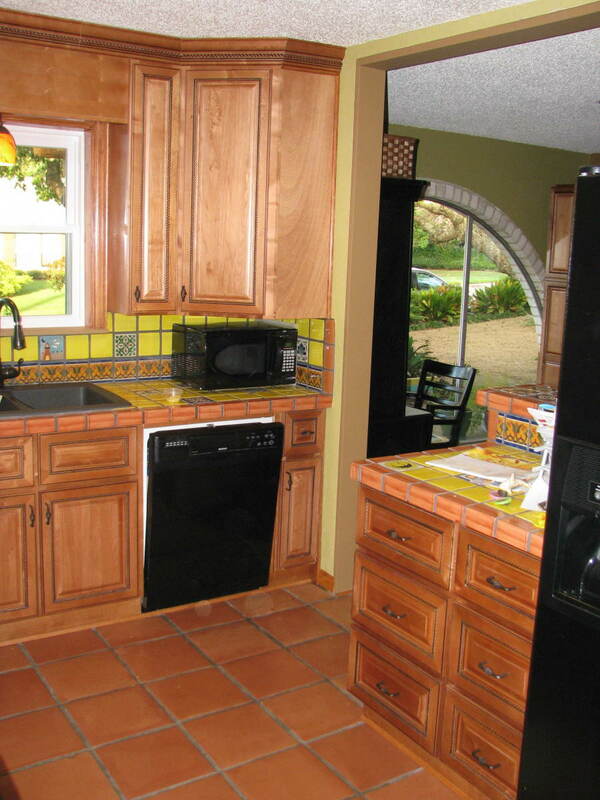 Does the color scheme make your kitchen look duller than a post office? Is everything so unorganized you can't even find a rolling pin without rummaging through almost all your kitchen drawers? Do the decorations seem boring rather than inspiring? If time and budget allow, you should redesign every single element that needs to be fixed. If not, choose to work on only one or two affordable projects that you think will make a big difference. What is the biggest issue you have with your kitchen? Cabinets definitely have a great impact on the overall look of your kitchen. If you let them get all dilapidated and dirty, they will make the whole room appear dreary. Cabinets that are well-maintained and stylishly designed, on the other hand, will lend a stunning visual interest to your kitchen. Replacing them altogether can be both costly and time-consuming, though. So try some of these budget-friendly solutions; they can add quite a bit of pizzazz to your kitchen. 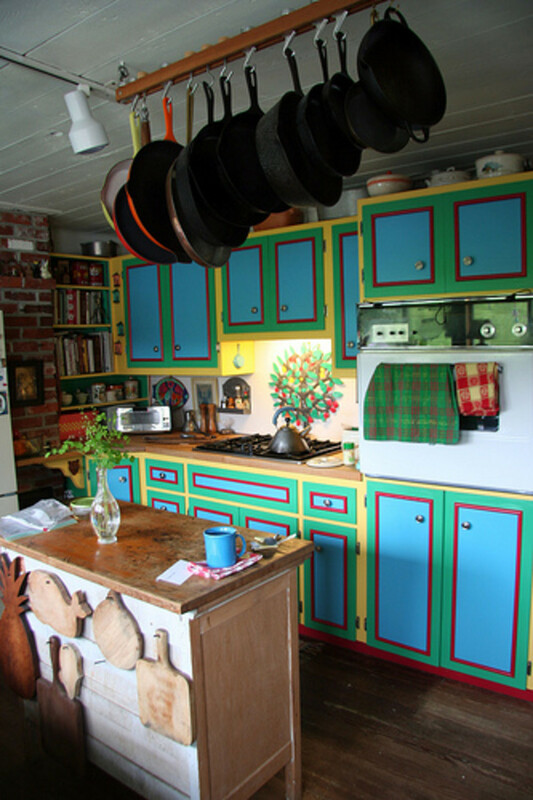 Add Color: You can give your kitchen a brand new look simply by repainting the cabinets. For instance, if you're sick of the room's neutral color tones, consider repainting your cabinets with a more dramatic color, such as red or green. This can enliven the mood of the entire room and make an outdated kitchen appear more modern. Keep in mind, though, that different materials require different types of paint. If you're not an expert in this arena, consult your local home-improvement store what kind of primer and paint will be suitable for your cabinet surface. 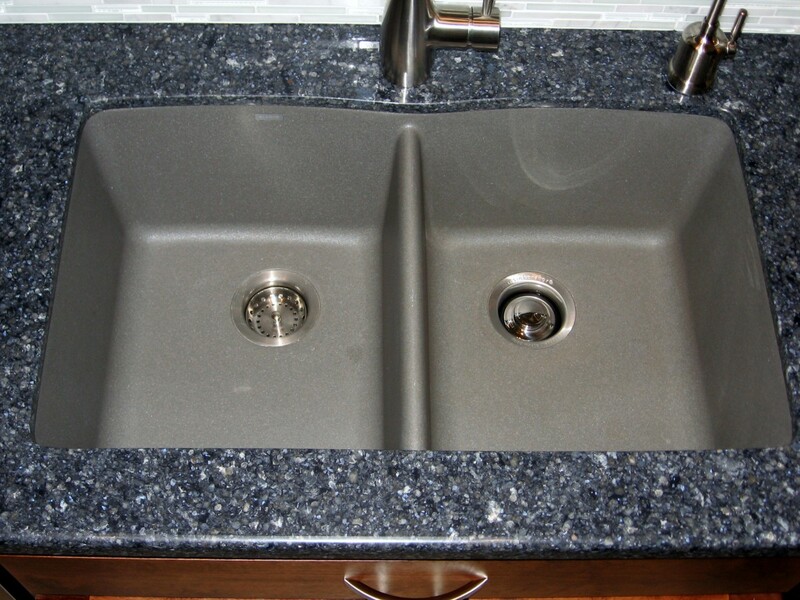 Replace Hardware: It doesn't cost much to replace cabinet knobs and drawer pulls. There are a myriad of designs you can choose from, either at a local hardware store or online. Plus, it can be done within one or two hours. You'd be surprised that little elements like these can pull your cabinets out of a style rut quite magically. Remove the Cabinet Doors: This kitchen redesign idea might not be appropriate for everyone. If you're inclined to overstuff your cabinets and not very savvy with kitchen organization, you'd better keep the cabinet doors where they are. On the other hand, if you're a pretty neat person, and have some chic kitchenware and gadgets to show off, consider letting your cabinets go naked. Besides the display purpose, this can also make a cramped small kitchen appear more airy and allow you to grab things from the cabinets more conveniently. How much does it cost to do this? Nothing! This is a matter of both functionality and aesthetics. 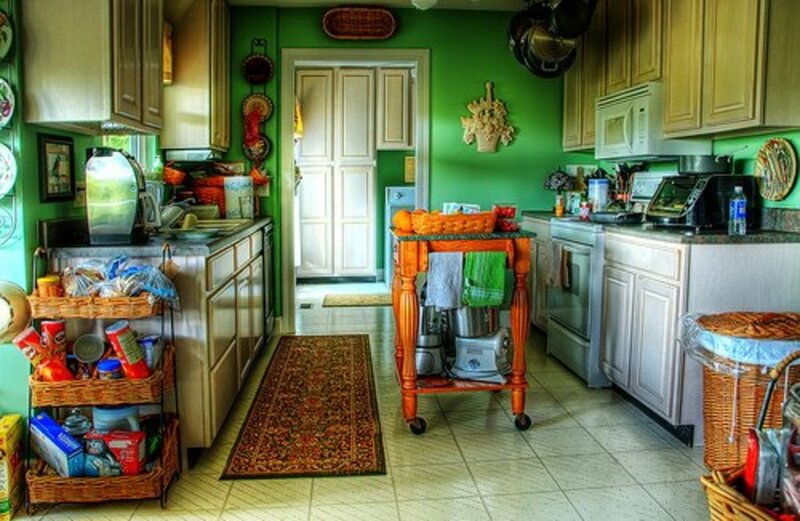 A poorly organized kitchen not only looks unpleasant but can also take the joy out of cooking. 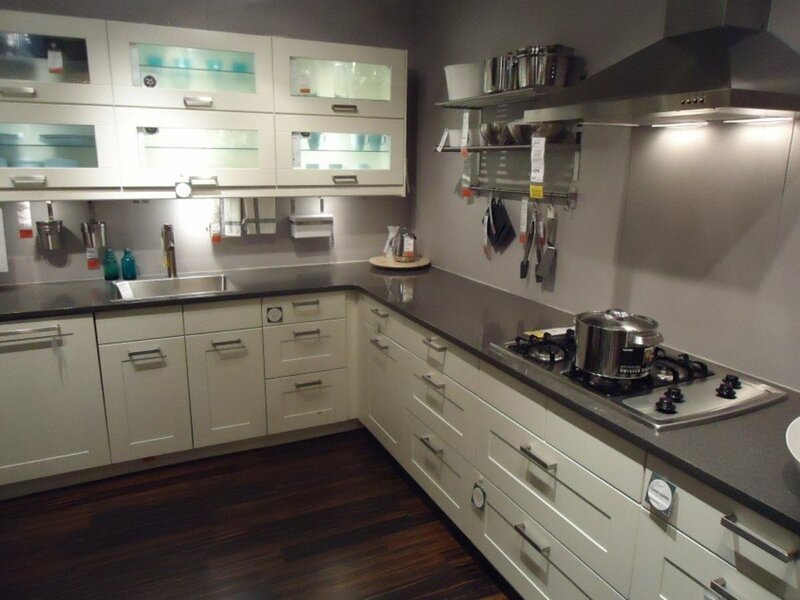 When redesigning the storage system, always have practicality, safety and the overall style of your kitchen in mind. Take a look at these smart storage solutions and decide which ones might be suitable for your kitchen. All of them are budget-friendly! Free-Standing Shelf Unit: If there's plenty of room in your kitchen, a free-standing shelf unit can be an excellent addition. It should be tall enough to accommodate a good quantity of things, and at the same time should be quite slender so it won't take up too much floor space and cause the room to look packed. Overhead Rack: This kitchen storage solution can work only if you have a relatively high ceiling. If the ceiling is low, an overhead rack with hanging pots and pans might just cramp up the room and also put your head at risk of injuries. Once you decide to go with this option, make sure you install it very securely on a spot where you can easily reach. Trolley: The best thing about a trolley is that it can be conveniently wheeled in and out of the kitchen. To maximize your kitchen storage space, you can use a trolley to store ingredients and tools that you hardly touch and keep this cabinet-on-wheels somewhere else. For example, if you're not an avid baker, you may use a trolley to store your bulky electric mixer, bags of flour and bottles of food extracts. Keep the trolley in a corner of your dining room and bring it into the kitchen whenever you want to bake. 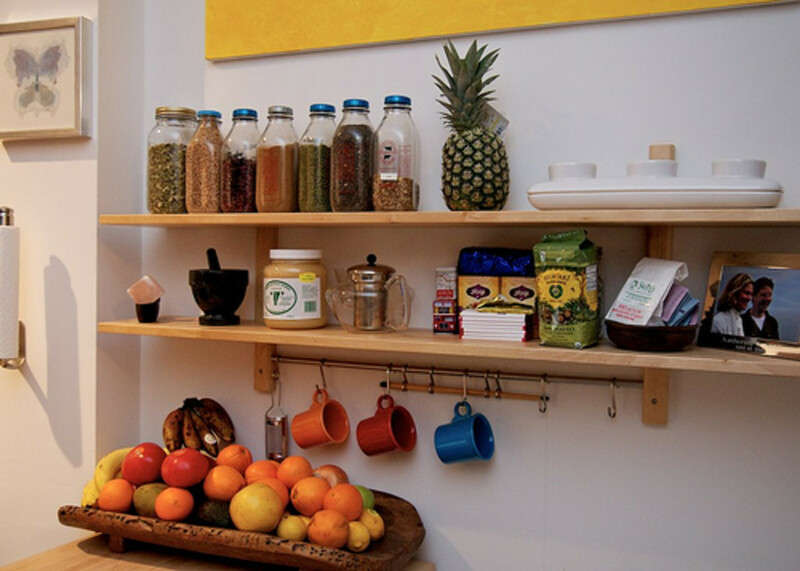 Wall Shelves: If none of the above options sounds practical for your kitchen, consider utilizing your wall space. Wall shelves are affordable and easy to install. (I have installed a few myself without any help from my hubby!) Furniture stores, such as Home Depot and IKEA, offer a variety of designs, colors and sizes. Other Little Tricks That Work: For those who have huge collections of plates, stacking them upright on plate racks can make them look very neat and save some storage space. You may keep your plate racks on open shelves if you want to be able to grab your plates quickly, or hide them in a cupboard if your prefer. If cups and mugs take over too much of your cabinet space, consider installing some hooks on the walls or beneath cabinet shelves. Which one of these sounds more organized? Neat rows of hanged-up cups or lopsided towers of mugs? Last but not least, if you're big on spices but low on storage space, magnetic spice jars are a great solution. Store your spices in those jars and stick them right on your refrigerator. Don't let spice bottles clutter your cabinet or countertop anymore. If you're a low-budget homeowner, you probably don't want to rearrange all the elements in your kitchen, especially things like the counter and the sink. Repositioning these elements will cost a lot of time and money. Plus, chances are you'll need to hire professionals to do it. However, there are minor rearrangements that can be done within a tight budget and time constraints. Work Space: Does your kitchen arrangement allow your cooking activity to go smoothly? If you have a spacious kitchen but not enough counter space, for instance, consider adding a kitchen island. It can be a large cabinet island or just a small table, depending on the size of the room. At some furniture stores, you might even find kitchen islands on wheels, which can make space adjustment very convenient. On the other hand, if the kitchen island you have is too bulky and makes it difficult for you to move around the kitchen, switch to something smaller or get rid of it completely. The placement of the refrigerator is also important. It should be close enough to your work area so that you can quickly reach for your fresh ingredients. Also, for those of you who like to cook with other people, your refrigerator should be placed where you can open it without obstructing anyone's passage. Seating Arrangement: If your kitchen also serves as a dining room, evaluate how your seating arrangement works out in terms of size and functionality. 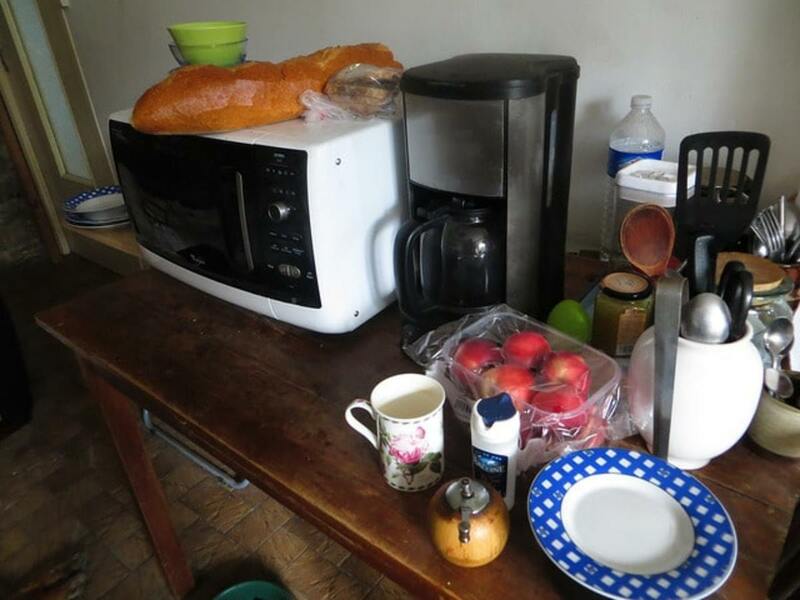 Why cram a bulky dining-room set into a small kitchen? Installing a wall-mounted breakfast bar and adding a few cute bar stools will make the kitchen appear a lot more roomy. Also, make sure your dining table isn't placed in an awkward spot. You wouldn't enjoy your dinner as much if you had to sit with a rack of dangling skillets right above your head, would you? Give liveliness to your kitchen by decorating it with some greenery. 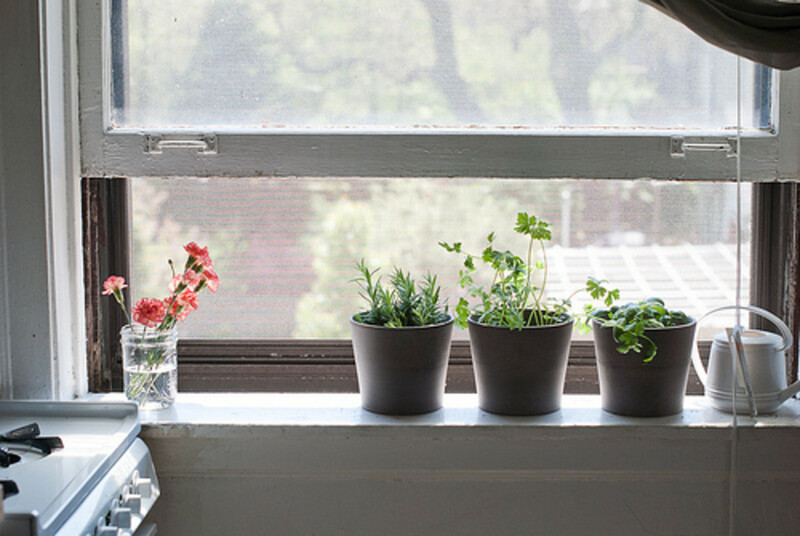 Choose potted plants that aren't too big and don't require a lot of sun. Or if you want to shoot two birds with one stone, try growing your own herbs, such as thyme, basil and rosemary. They are décor items that can also help you save a little bit of money on the grocery bill. Isn't that great? Any dry ingredient from loose-leaf tea and cereal to shell pasta and cinnamon sticks can be easily glamorized. Put them in cute glass jars or any transparent containers with lids, then line them up on your kitchen shelves. Fresh fruits can make a colorful display as well if you arrange them in a lovely basket or on a chic tray. To buy glass jars for cheap, visit your local thrift shops or dollar stores. If your cabinet contains many open shelves that you have a hard time keeping tidy, consider hanging up pieces of fabric or curtains to conceal your mess! You can do this by installing an expanding wire along the upper edge of your top shelf, then simply drape a beautiful piece of fabric over it. Better yet, if you don't mind sewing, you can turn your fabric into a real slotted curtain; it will look a lot neater this way. The kitchen is one of the most important areas of the house. What a wonderful hub ; I loved it. Love, love, love this Hub. 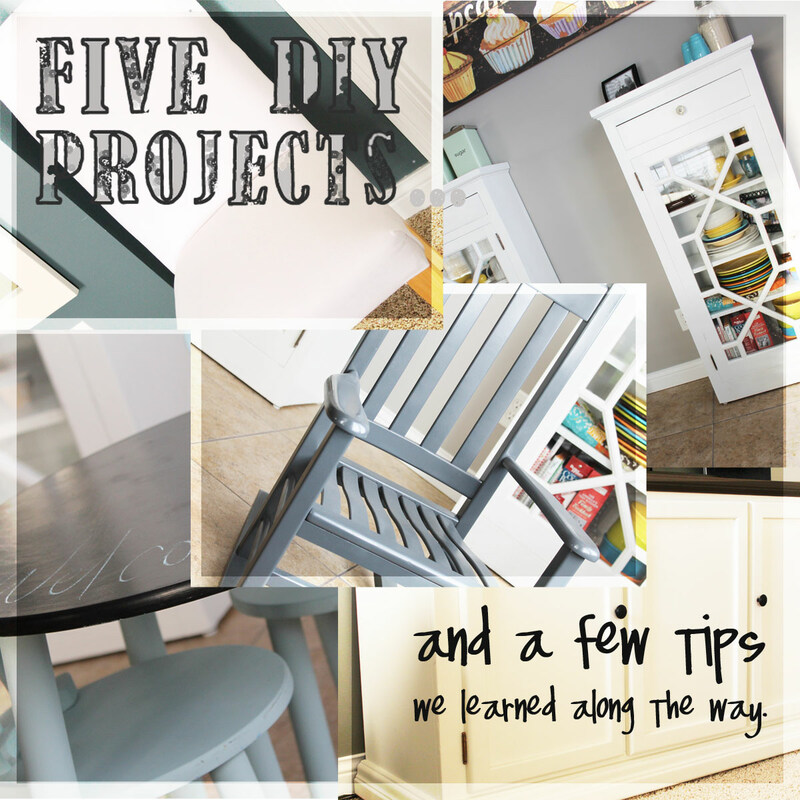 It is brimming with great and inexpensive ways to give any kitchen a well-deserved face lift! Voted up and shared! @Peggy W - Thanks for your comment and vote, Peggy! @Simone - Yep, the kitchen is definitely the heart of most homes. I cook with my friends sometimes, so my kitchen is like my second living room. When I look at someone's home, my ultimate judgment point is the kitchen. They're the heart of so many homes, and definitely deserve attention. It's great that keeping them fresh and beautiful doesn't have to cost a lot. Love your ideas! Voted up and useful. You have offered many suggestions in this hub regarding tweeking designs of kitchens done on a budget with limited means. Good job! @Arlene V Poma - Good to see you, Arlene! I actually can't do too much with my own kitchen, either. We're still renting so we're not allowed to make drastic changes, such as removing the cabinet doors or repainting the whole room. Sometimes little sprucing here and there can make a big difference, though. @Ruchira - Thanks a lot, Ruchira! @kartika damon - Thanks! So happy to hear you enjoyed the hub. What fun ideas here! You definitely gave me some stuff to think about. I LOVE cooking, but my kitchen is icky. I haven't had a chance to remodel it and there's not enough counter space and despite painting the cabinets a creamy white when I moved in, it's still awful. I wish I could just magically make my kitchen look like the one in the first picture. :D Thanks for sharing this. great ideas and tips, OM. You have done a fantastic job by designing a kitchen in a budget. I have a 70s kitchen, and remodeling is not in my budget. If I was serious about entertaining, it would be a different story, and I would at least make an effort. A copy of your article can keep me dreaming. @Kulsum Mehmood - Thanks a lot! Beautifully written hub with great photos and great ideas. You have so many great tips here, Om. 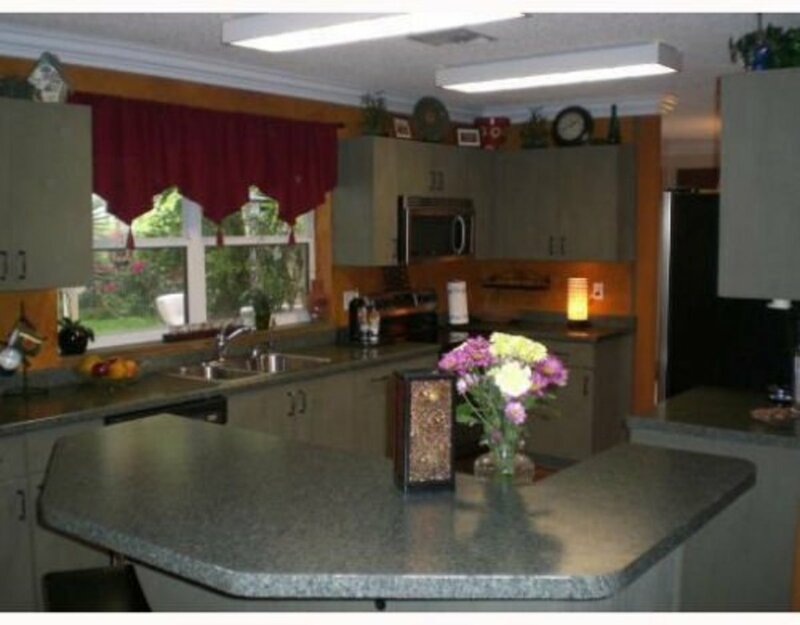 We redid our kitchen a few years ago, and saved a lot of money. We didn't replace the cabinets, but had them refinished (they were a very dark 1970s oak, and we had them refinished to a lighter color). My husband also did all of the tile work himself, though he is quite handy! Love this Om, as replacing a kitchen can be a pricey business. The kitchen in my last house was very big but had very little in, so a trolley, new décor and shelving would have made it more homely. I considered painting the old fashioned cupboards but we moved house. You're very welcome, snakeslane. Glad you enjoyed the hub!